The Samurai X live action movie adaptation was only available for special screening in a nearby local SM cinema in the province where I live. There were just two time slots available per day this week. We availed of an early 11 AM showing during the beginning of the week. There were no other viewers except us when the screening started. Also, throughout the movie, only a few couples and solo movie-goers have flocked the small town mall cinema. The scenario above is in contrast with how much the Philippine audience has actually embraced this anime adaptation film. In fact, the worldwide gross of the movie in over 60 countries is at $61.7 million as of November 2012. In movie houses all over the Philippines, screening was even extended since its release early December. The film started its global impact after it was first shown on Aug. 25, 2012 in Japan and had since then swept anime lovers the world over. News about this adaptation flick had been read in several sites since January this year including how it was due to be released here in the Philippines. But fans have been excited long before that because production was announced mid-year last year (2011) or even as early as 2010. You can read reviews about the movie from those who were already able to watch it back in August. But it’s always different to see it from a very personal perspective. But before I write my own thoughts about the film, below is a brief summary of the Samurai X live action movie adaptation. The first scene opens with the Battle of Toba-Fushimi which had paved the way to the New Age of Japan. The samurai way of lifestyle had been finally defeated during this battle and the legendary assassin Hitokiri Battōsai had abandoned his famous sword. The same sword was picked up by a surviving warrior of the opposing party named Jin-e Udo, who had since then assumed the role of Battōsai in a killing spree which had spared no one. He went on a rampage running after both the lawless and those who practiced the law of the land like a madman with an uncontrollable taste for killing. Meanwhile, the real Battōsai had disappeared for a decade. But news about a Good Samaritan helping the needy, weak, and poor had reached the radar of the new Meiji government. This helpful samurai sporting a back blade sword is no other than the genuine Battōsai who now calls himself Kenshin Himura. In Tokyo, he made acquaintance with the dojo heir Kaoru Kamiya, whose family’s legacy had been tainted by the fake Battōsai pretending to have learned fencing from her family’s school. The school had no more student left but an orphan boy named Myōjin Yahiko. The act was actually only staged to discredit the dojo and make it easier for Jin-e’s boss, the cunning businessman named Takeda Kanryu because he has plans to build a port from where the dojo stands. This will make it easier for him to export his opium all over Japan. The black opium called “spider web” was made possible with the aid of Megumi Takani, the only survivor of a family of physicians. She escapes and joins Kenshin’s group in Kaoru’s dojo. Soon after, the fist fighter Sanosuke Sagara becomes their ally and even assisted Kenshin in rescuing Megumi, who surrendered herself to Kanryu with the attempt to kill him and end his vile ways. Even Hajime Saito, a former samurai who worked with Battōsai in the past had helped arrest Kanryu and his men even if the latter had armed himself with 250 ex-samurai men, a few undefeated personal guards, and a gattling gun. The movie ended with Jin-e’s defeat when he took his own life after losing his hands strength over one of Kenshin’s deadly blows. Before that epic battle, Kaoru was kidnapped and placed under Jin-e's “shadow of the soul” curse, strengthened by fear. She was able to win the battle against it to free her lungs and breathing so Kenshin did not have to kill Jin-e just to break the curse. None of Kanryu’s men died during the battle in his mansion earlier too. 1. Condensed plot. If you would watch the entire anime series or at least the episodes referencing this adaptation’s plot, it will take days watching it on DVD or months waiting for every TV show weekly or even daily; whereas, the movie runs for only 134 minutes. 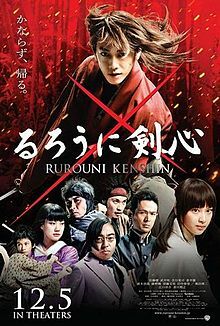 So, you can watch a condensed and summarized version of the whole series or several chapters of the original manga Rurouni Kenshin by Nobuhiro Watsuki. 2. Highlights narrated. In relation to the condensed plot, you won’t miss anything in this live action version. Major highlights in Rurouni Kenshin’s life have been narrated. These include the concluding battle which caused him to abandon his Battōsai sword and assassin history; his life as a wanderer which eventually led to his acquaintance with Kaoru and him saving her dojo; how the other characters were introduced into his life (Myojin, Megumi, Sanosuke, Kanryu, and the Meiji government officers Saito and Yamagata); his epic battle with Jin-e; and even the details of his assassin past including how he had been marked with that famous scar. 3. Action packed fight scenes. Sword or fist fights were executed beyond what the anime can achieve. There were all too many minor and major action scenes to digest. Each one is breathtaking in execution, thanks to the director Keishi Otomo. Some of which include Jin-e and Kenshin’s fight at the finale; the whole rescue mission for Megumi including Sanosuke’s bare fist fight with one of Kanryu’s men and Kenshin’s own battle against the rest; Kenshin and Sanosuke’s brawl at a public restaurant’s premises over Kanryu’s offer to employ them as guards; Saito and Kenshin’s fight outside Yamagata’s office; and Kenshin protecting the Kamiya dojo from paid mercenaries of Kanryu. 4. Moral lesson. The movie didn't simply infuse a moral lesson into its plot, the plot is actually the moral of the story. Kenshin explaining why he had forsaken his old ways is epic. It reminds me of Taken 2 with Bryan Mills mentioning that revenge is a never ending cycle which only breeds hate if not stopped. Also, a friend (Kenshin) saying that anyone is worth saving in reference to Megumi's rescue is heartwarming. 5. No sensual scenes. Although the anime actually had scenes with sensuality involved such as Myōjin's innocent infatuation over Megumi and the latter's utter advances for Kenshin, the movie didn't; not even for Kenshin and Kaoru. Romantic scenes are very subtle and lacked lewdness, which is unnecessary anyway. 6. Travel back in time. If you love reading about the old Japan including its architecture, women’s fashion, and scenery, then you’re going to love this flick for its superb scenes. The whole film from start to finish depicts Japan in its glorious era that will let you travel back in time. 7. Effective cast. Each cast had portrayed their character effectively starting with Takeru Sato of the Kamen Rider Den-O fame. His body built and height is perfect for Kenshin Himura’s stature as depicted in the anime and manga. Even Emi Takai is adorable with that soft voice typical of Japanese women. Munetaka Aoki and Yu Aoi also fit their characters as well. But above everyone else, it was Teruyuki Kagawa as Takeda Kanryu who stood out for his character portrayal. He was supposed to be vile and yet everything about him is funny. 8. Soundtrack. The background music throughout the film is also captivating. I love the official theme song The Beginning from ONE OK ROCK. It offers just the right beat for an action packed movie as this Samurai X live edition. The global audience can also easily relate because it’s infused with English lyrics which sounded natural. The rock genre also transcends time as anime lovers from all time starting from those who have followed the manga and anime version of Rurouni Kenshin years ago to the new breed of followers recently. 9. English subtitle. Unless you understand Nihongo, you won’t comprehend anything in the movie. But thanks to English subtitles below the moving pictures, you can follow each conversation and storyline including the narration. It was both simple yet poetic at the same time. If you haven’t watched the Samurai X live action movie yet, you can still catch it while you can in selected cinemas all over the Philippines!